Today i would like to share abit what have i learn from the Certified Speed and Agility Coach by Athletes Acceleration .Hope you all enjoy . -when you feel pain during foaming , do wind shield wiping internal and external rotation ( cross sectional rolling) . Ready for tissue when blood supply is there and tissue and cells have strong contraction . -Long arm action ,and same side legs lifted fairly high . Throw your hands back. Right leg back ,left hand at the front bend at 90 degree .slightly bent on knees . -Front legs tap on toes ,so that we can push off on our toes . 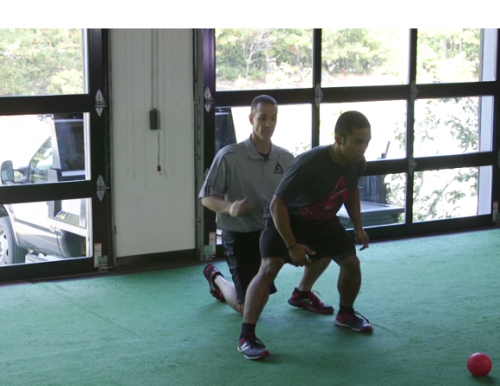 – On a sprinting position ,put a ball in front of the athlete .ball will be about 4 feet infront of the athletes . – The first step of the athlete need to stride at the ball and push off from there.Cueing more arm swinging action .Throwing arms to the back. Use tennis ball to “bait” the athletes perform tennis ball reaction drill . -kick off from the ball of the foot .Put the knees forward.Load on the hips (whichever the legs in at the front ,the same side of the hips should be feeling the load. 2) Throw your shoulder out there. 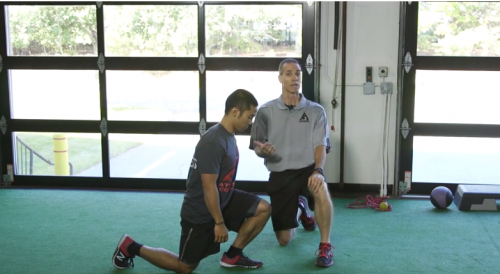 Load the knees ,and the hips.Make sure shouders and hips are align ,and chest up. Hand on shoulder width and height. – make sure that the core can handle the body posture and stability the hips .If hand too high ,the hips cant get hit . If the athlete is not good at the drive down legs ,we will give him a drill on stepping down like poping a ballon on the floor. Cueing= left knees up ,think of pushing the right toes on the floor ,and step down on the left leg. 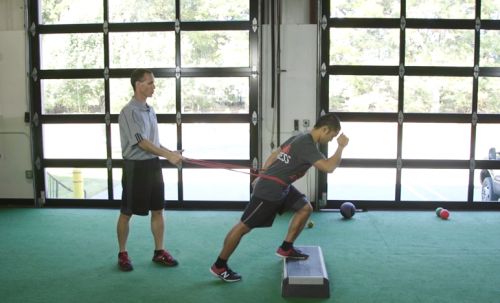 If the athlete cannot do a full triple extension posture..
Use a band and ask them to go against your pull. To generate even more power and longer stride . Put the legs all the way back.to add difficulty add band on it.Make sure drive with hips, and triple extension. 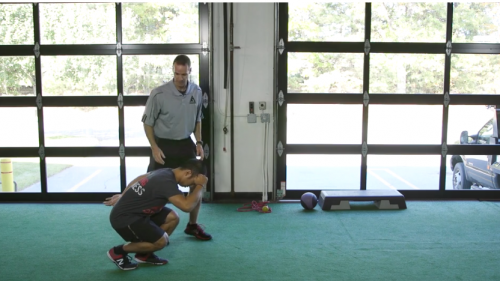 – to train the posture that lead to acceleration . – Cueing =Body need to stay on the tunnel .Keep body low all the time. – when moving lateral to the left ,kick off using the right leg. -legs need to go down and away . 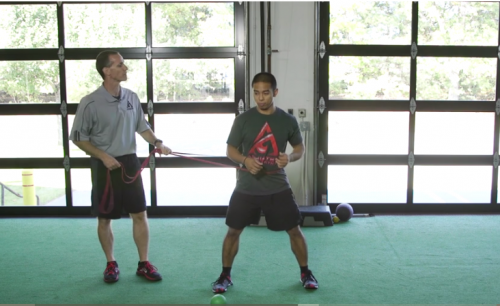 If shoulders and upper body is not stable ,put a band onto their body.